Another project finished. This time, it’s the Jewel cardigan from Kim Hargreaves’ book Amber. I used another yarn from Brown Sheep – Nature Spun in sport weight. It works up to the same gauge as their Lanaloft but it is a 3-ply yarn so the stitch definition is much crisper. It comes on cones, as does Lanaloft, which is very convenient for storage and leaves fewer ends to weave in at the end of knitting. 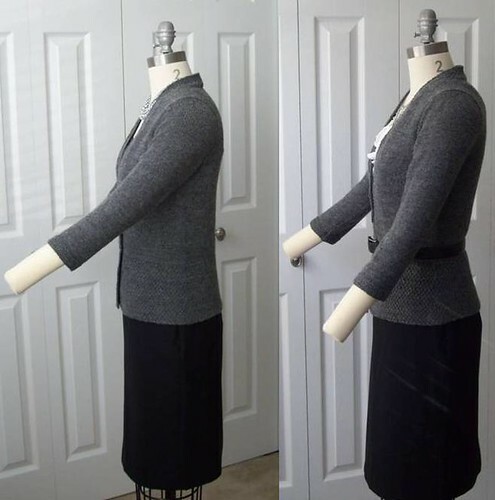 The shape of the cardigan is nicely fitted at the sides. 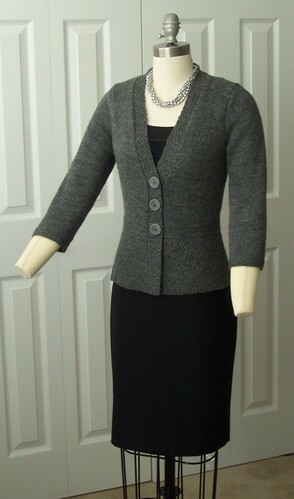 There is no shaping at the center back so the cardigan hangs fairly straight down, as viewed from the side. I like it better pulled in closer with a belt. The depth of the neckline definitely requires something underneath. It is a great layering piece and I am already planning to make it again. 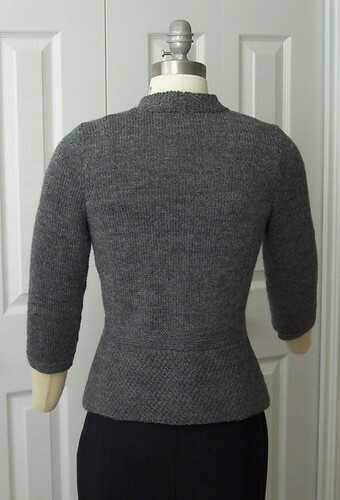 As with my previous knitting projects, I made this one without side seams – the fronts knitted in one piece with the back up to the armholes. I find that it makes for quick knitting because I do the biggest portion of the work while I’m still riding the high of the initial excitement. From the bottom of the armholes, things go much faster: I’m working fewer than half the total number of stitches and I’m decreasing for the armhole at the same time. The body of the sweater is finished before I know it. And then it’s just the sleeves and finishing. Easy-peasy. I wish I could knit. This is first class work. 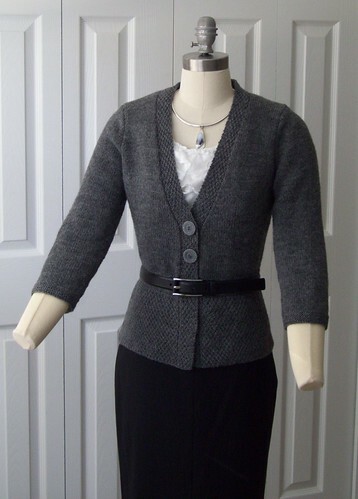 That is a very elegant cardigan. I am sure you will wear it a lot. Great job! That is truly stunning Alexandra… You do such fine knitting. Congrats. That is a beautiful sweater. I am envious of knitting at that level. Very nice. This is my first visit to your blog, and you are a knitter and sewer extraordinaire! Beautiful sweater! Gail had written “I wish I could knit” what I was think when I saw your sweater. WOW! It beautiful.I just know how to do a perl and knit stitch….a long way to go.